Ranch dressing, a common salad topping, combines ingredients like mayonnaise, buttermilk, lemon juice and herbs and spices. This type of dressing also serves as a creamy, tangy accompaniment to a range of foods, including French fries, fresh vegetables and chicken wings. Ranch dressing may be one of the top selling salad dressings in the U.S., according to the Missourian, but it's not the healthiest choice with its high fat, calorie and sodium content. A 2-oz. serving of ranch dressing has 188 calories, or 9.4 percent of the amount you should consume each day if your meal plan limit is 2,000 calories. While you may consume ranch dressing by itself, this is not common practice -- a serving of this dressing adds quite a few calories to the foods you pair it with. Each serving has 17.4 g of fat as well, which contributes considerably to the recommended limit per day of 44 to 78 g, or 20 to 35 percent of your calories. Despite this, only 2.7 g of the fat in ranch dressing comes from saturated fat. The saturated fat in this dressing is only a small portion of the 15 g suggested limit. Ranch dressing contains 6.7 g of carbohydrates per serving as well as 1.7 g of protein. An ideal meal plan contains 225 to 325 g of carbs and 46 to 56 g of protein as these macronutrients meet your daily energy requirements. While the carbohydrates and protein in a serving of ranch dressing do not come anywhere close to meeting these needs, they do contribute to energy as well as other bodily functions, such as hormone and enzyme production. The vitamin content in ranch dressing is not particularly high. One serving provides 5 percent of the riboflavin, or vitamin B2, your body each day, which makes ranch dressing useful for encouraging red blood cell growth. The dressing also provides 1 percent of the daily recommended intake of vitamin A, vitamin C, vitamin B6 and pantothenic acid, also known as vitamin B5. Ranch dressing contains 4 percent of the daily recommended intake of calcium and phosphorus per serving, which gives this food a role in strengthening bones and storing energy. Each serving contains 2 percent of the potassium you need each and 1 percent of the iron your body requires each day as well. These amounts do not satisfy your nutritional goals, so supplement your meal plan with mineral-rich foods for optimal health. The American Heart Association recommends that every person avoid eating more than 1,500 mg of sodium per day, although this is particularly important if you suffer from heart disease or have high blood pressure. 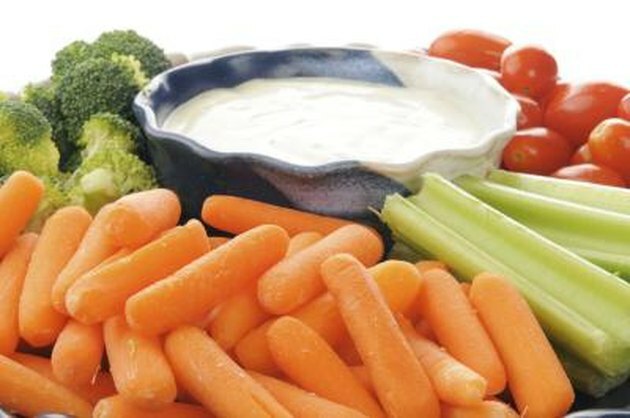 Ranch dressing contributes nearly half this amount, with 627.1 mg per serving. The U.S. Centers for Disease Control and Prevention allows a slightly higher level of consumption for healthy individuals: 2,300 mg per day.